Punch or die cut a circle of cardstock, stamp it if you wish or use patterned paper. Add a little touch of adhesive to the circle front. Then take a snippet of ribbon, about 3" in width, and form a loop. Place your ribbon loop onto your circle and hold with your fingers. Center a button over the top of the ribbon loop. Using twine (I'm using Martha Stewart twine)....or embroidery thread, floss, string,etc.......sew the button to the circle. You'll end up with both ends of the floss at the front, then just tie into a knot. Below are some versions of my button baubles. The top two were done using the method I explained above. The bottom left has the ribbon loop tied on top of the button and the bottom right shows a snippet of ribbon tied on the top of the button with the ends trimmed. Lots and lots of variations you can do. And here's a finished card using my button/ribbon embellishment. 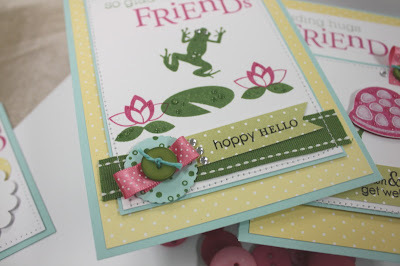 All of my projects today use Pond Life, Hibiscus Burst and New Leaf ribbon, 2008 Bitty Dot Basics patterned paper, Stamper's Select White cardstock and Aqua Mist cardstock. Ink is New Leaf and Raspberry Fizz, and of course Vintage Buttons. I think the button embellishments add so much detail to projects. I love the little *hoppy hello* accent piece too. And here's a little Artist Trading Card (size is 2.5" x 3.5") that I made using scraps from my cards. I used two pieces of Hibiscus Burst ribbon and simply adhered a threaded button on top. Such a perfect little accent piece to finish off my project. Let's chat a little about adhering buttons to your projects. You can do this several ways. One way is to use glue dots that come in the little boxes. I use these if I'm adhering buttons directly to cardstock, they stick really well. Another way to adhere buttons is to use a liquid adhesive, Zip Dry is my favorite. I use this method if I'm adhering buttons to something a little bulkier like ribbon or fabric. A clothespin helps keep the button secure until the glue dries. And yet another method for adhering buttons is to simply sew them directly to your project, using a needle and twine or thread. Pop dots also work well if you want your buttons to be raised off your project a little. Today I have my little one home sick. Such a pitiful sight to see your child sick..especially when she's in her fuzzy pink robe and tie die fuzzy slippers with flushed, freckled cheeks. So while I should be playing catch up on blogging and creating and housework, I've spent a good part of the day just watching tv and hanging out with Jordy. I did have to do a little work to finish out the month so I tried to include Jordan when I could. I told her to set up her tea party stuff she had out and that I would make a surprise for her little friends. Meet Lamby (she's on the right) and her little friend. Lamby was given to Jordy by my husband (I picked her out but dear ol' Dad gets all the credit for giving Lamby to Jordan) and she's been Jordan's favorite little friend ever since. She is worn, well loved and dirty but that's the way she'll stay so that she doesn't fall apart. That little bell that Lamby is wearing was in Lamby's stocking from Santa last year. Well, here's Lamby and her little friend all ready for a tea party. I made some special desserts for Jordan and her little critters. The lambs get to have a Hershey's Kiss, complete with little scalloped place mats that I made. Just the perfect little size for their adorable table setting that Jordy set up. And we got to have a fun treat called S'more Puffs. My mom gave me the recipe that she got out of a magazine. Now we're able to have S'mores anytime we want...made right out of our own oven. They are heavenly little morslets, let me tell you! Top a Ritz cracker with a Hershey Kiss and 1/2 a giant marshmallow. Bake at 350 degrees for 8 minutes. Droooooooooool! I thought these would make cute little snacks for the next time the girls had friends over. They take no time at all to assemble and bake, the perfect snack! The little kiss accents were easy to make too. I simply stamped a brand new recipe sentiment from Just Rite's Recipes Borders and Centers set onto white cardstock with brown ink. (Please note that you'll need the new wooden circle stamper to use this new set ). I cut the circles out using Spellbinder's Circles and Scalloped Circles Nestabilities Die Templates. If you wanted, you could adhere the kisses onto the little embellishments but I thought it would be fun to keep refilling the little plate. I can't wait to use these stamps more, I've got to get busy on more recipes! And of course I had to make a recipe card for my files. I used one of the little circle embellishments and just added a Papertrey heart from Heart Prints in the middle. I adhered that onto some October Afternoon patterned paper to finish off my 4 x 6 recipe card. I also added a little stitching around the recipe card to add a home made touch. I didn't want the bulk from the actual thread, so I just stitched around the card without the machine being threaded.......awww, who am I kidding......I ran out of thread and didn't feel like winding a new bobbin so there you have it! LOL!! It still looks cool though. Oh, and back to those S'more Puffs.....here's a close up shot of the ooooey.....gooeyyyyyy marshmallows. And just in case you're wondering......yyyyyyes, the Hershey's Kiss actually melts in your mouth. The buttery, salty Ritz cracker is so perfect for these too. It kind of tastes like a pretzel with that saltiness......but then the melted chocolate and puffy marshmallow hits your tongue. Heaven, I tell. Make some. You'll be glad you did. Also, be sure to check out Just Rite Stamper's BLOG. 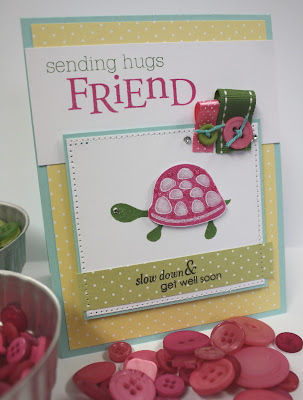 Lots of new samples and a previews by Dream Team Stampers. Edit: The link below is the one I've always given out for the free Becky font. Apparently it's not working correctly. I don't have any other solutions except perhaps you could go to the Creating Keepsakes homepage and try accessing it from there. If anyone finds a link, I'd be glad to post it. Hi everyone! We had ice storms roll through and we've been without power since 8am yesterday. We're at my in laws right now taking showers and checking in. Just a quick post for today and hopefully our power will be back on soon at home. I love Karen Lockhart's old time fan stamp, it reminds me of this vintage blue one that we had growing up. I was always scared someone was gonna lose a finger or a toe though. It oscillated and we talked into the fan to make funny sounds. I colored the image in with Copic Sketch markers and added some fun bee stamps from My Cute Stamps. I wanted a fun sentiment to go with my fans so I created one using the CK Becky Font. Together with the bees that look like they're being blown away, my sentiment ties in well with the theme of the card. I finished off the card with some October Afternoon patterned paper and one of my button embellishments that I had leftover from my stash. Hope you're having an "electricity filled" weekend...I've never appreciated my hair dryer and flat iron more than today!! I broke into another stamp set from My Cute Stamps. I can't resist the cute snails and this cute little bugger is so adorable! I combined some fun elements for my Snail Mail theme: My Cute Stamps snail with paper pieced shell, My Cute Stamps branch with paper pieced leaves, Snail Mail and tiny envelope from Papertrey's Mailbox Greetings and one of my button embellishments from my stash. Aqua Mist polka dot paper from Papertrey, green patterned paper from Cosmo Cricket. Images were colored with Copic markers then cut and embossed with Spellbinders Rectangle Nesties Die and then layered onto Papertrey Melon Berry cardstock layer cut with Spellbinder's Scalloped Rectangle Nesties Die. For the leaves, I cut out my entire stamped image and then paper pieced the leaves and adhered them so that they hung over the edges. Are you sending out those cards you make? Don't just let them sit all pretty in a basket...mail them out to the special people in your life!! It will make someone's day. Are you a robe wearer? I am not. It feels too much like a coat and I rarely wear those either....too many heavy layers. But I do love the feeling that you get when you think of fluffy pink robes, which is why I used Karen Lockhart's Robe stamp for my cards today. Here's all my supplies gathered up.....Lockhart stamp robe image and sentiment, Papertrey buttons, cardstock and ribbon, My Mind's Eye patterned paper, EK Success edger punch, Copics (not shown): The main images for these get well cards came together really quickly. I simply stamped the Robe images onto patterned paper and cut them out with fine tip scissors. To add a little definition to the stamps, I colored in a few areas with a light pink Copic marker. Copics are great for adding just a little shading here and there where needed. Tip: You can use light gray markers to make any color look a little darker, in case you don't have darker shades of a certain color. I adhered my images to the cardstock with pop dots, then used ribbon and buttons and some messy stitching to finish off the main images. The curvy get well sentiment allowed me to nestle the Robe right in. The rest of the cards are finished off with more patterned paper, velvet ric rac (May Arts) and some curvy cut edging on the bottom of the cards. Spring is knocking on our door so hopefully this ugly flu season will be behind us soon. Which means the annoying allergy season is here for my husband. He sniffles and snuffles and snores all night long. It means many a sleepless night for me! There are nights where I wish I had a fluffy, pink robe......so I could smother it over his snoring head! (I did not just say that!) Anywayyyy, it's nice to have a few get well cards on hand just in case. Have a great day everyone! I remember how excited I was to get Papertrey's Green Thumb stamp set. It was one of the very first PTI sets and I still reach for it when I'm in a gardening mood. I needed some birthday refills for the ol' stash so I created this springy looking card. I used several elements from the set to create a flower pot of pretty pink flowers. The aqua mist pot was stamped, paper pieced and then attached to the main focal image with pop dots. Pink sequins accent the flower centers. I used Aqua Mist cardstock the focal image mat, along with Aqua Mist Saddle Stitch ribbon and Sweet Blush Satin ribbon. I used my sewing machine to add a few messy stitches to secure the ribbon down. Base card is Kraft with Fresh Snow dots from Polka Dot Basics. Patterned paper is from My Mind's Eye Penny Lane Collection. Sentiment on circle is from Mega Mixed Messages. Vintage button with ribbon and twine accents the flower pot. I stamped the sentiment from Green Thumb on the inside of the card along with some Fresh Snow flowers and a strip of the patterned paper. Hope you had a great weekend! We did a lot of hard, back breaking work in the garden but it felt good to work together and laugh as a family. It's back to school for my girls tomorrow as Spring Break ends. We had SO much fun, I'm going to miss the little squirts during the day!! Thought I'd try my hand at some Lockhart cards using my Spring Inspiration stash of goodies. 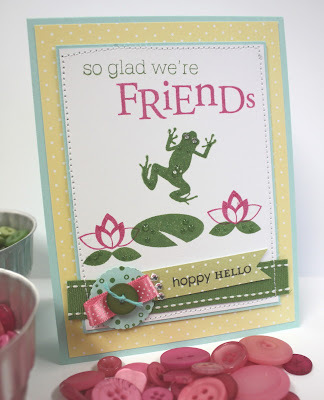 Whenever I have cards made up with Karen's Vintage Garden Chair stamp, they always fly out of my stash basket. I think these chairs bring a sense of nostalgia to a lot of folks, bringing back memories of when they sat in chairs just like these. When I go to my parent's house to visit, we still sit in these kind of chairs...grass green is the color. They're squeaky and a little rusty, but still our favorites. I colored my stamped image in with Copic markers, using a very light touch and a Colorless Blender to soften up the colors. I finished up my image with a Lockhart sentiment, just perfect for the chair image. I embellished my card with a Spellbinder's Scalloped Nestabilities Rectangle, some of my handmade embellishments from my stash, Cosmo Cricket Girl Friday patterned paper and Papertrey Polka Dot Basics for the card base. 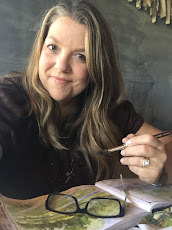 I've been reading my friend Dawn's blog and how she's been sittin' out in their deck chairs. We've had some pretty nice weather here in Kansas....getting chillier as I type...but lawn chair weather will soon be here! I hope you have a relaxing kind of weekend!! Whew, just sent my Josey girl off with some friends for a fun 3 day weekend trip to a hotel with a water park and a trip to a big mall. She was so excited to go! Jordan is not so excited because she has to stay home....but we have some new art supplies and her quilt to work on so once we get started, she'll be in heaven. I've been having a little fun of my own this Spring Break. 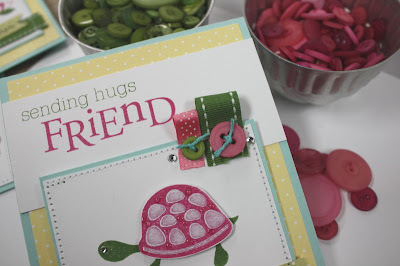 Just take a look at all these creations below: Knowing we have the whole week to just hang out, I went *shopping* in my stamp room for my Spring Inspiration Station goodies. 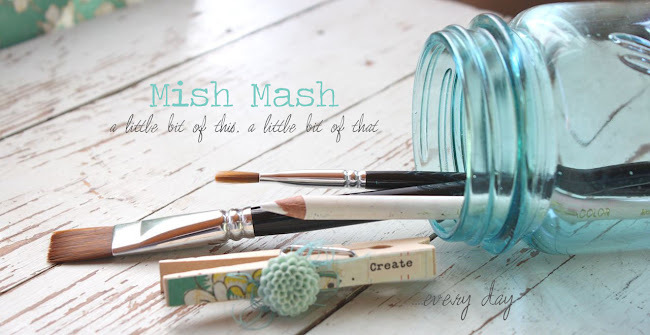 My first inspiration came from the adorable patterned paper called Girl Friday from Cosmo Cricket. 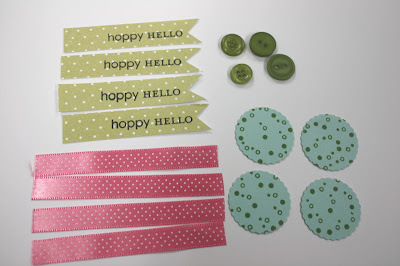 I dug out colors from Papertrey that matched perfectly, including Vintage Buttons and ribbons and cardstock in Kraft, Sweet Blush, Melon Berry, Aqua Mist and Spring Moss. Don't you just want to swim in these papers??????? No bikini required!! I digress but I know you like my stories. I set out to make some homemade embellishments for my projects. Have you seen the price of those little packages of cute embellishments lately? You pay $5 bucks or more for a little pack of 5-6 thingies to stick on your projects. Crikey, that's a lotta bucks to shell out for just a few baubles. So I made my own. These are some ribbon strips that I made by stamping a sentiment (I'll get to the stamps in a bit) onto white cardstock and then adhering them to ribbon strips. The *hello* flags are made by stamping onto cardstock and then notching out one end. These are delicious little morslets of goodness I created, and I am in LOVE with them. More bliss. The little ribbonlet embellishments at the top are snippets of elastic ribbons(Archiver's) that have buttons sewn on with Martha Stewart twine (available at Ellen Hutson's store). 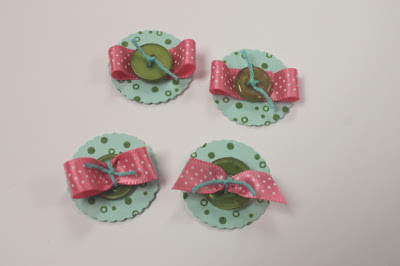 The circle button baubles were made using a Martha Stewart scalloped circle punch, some Papertrey Melon Berry ribbon, Papertrey New Leaf Vintage Buttons and more Martha twine. I also stamped polka dots on the circles. These will attach to my projects with pop dots. LOVE!! And these are little Cuttlebug flowers. Jordan wanted to join in on the fun so she cut......and cut, cut, and cut til I told her to stop!.........I topped the flowers with Melon Berry Vintage Buttons and some ribbon and twine (Stampin' Up!). And here are my finished cards. I'm using some adorably cute stamps from My Cute Stamps....acrylic stamps that have the cutest little images. For all of my cards, I used a Papertrey Kraft base with Fresh Snow polka dots. And then I just went to town with all fun embellishments and paper. These are some cute owls. And here's some fun flowers and birds. I just kept my little stash of goodies nearby....each card has one of these morslets of cuteness on it somewhere. Here's some flowers and birds. Be sure to zoom in to see my paper pieced mushrooms and worm. And I even made a sympathy card for a friend. I thought the cheery flowers would be nice this time of year. Ohhhhh, I've so much fun! You'll be seeing more from my Inspiration goodies this month for sure. I've been working on some Lockhart projects and more so stay tuned. Wanna see some other fun projects using My Cute Stamps. You're in luck because my friend Pine(Heather) and Kendra have some projects today too. Be sure to check out their blogs today. Thanks for stopping by! Just a short post for today as the girls and I have some Berry Patch dolls and accessories to set up. We're having a tea party for all of Jordan's lambs...she collects them and just got a new Webkinz Lamb. We're meeting up with some friends tomorrow to go roller skating at the skating rink so I thought some little gifts would be fun to take along. Remember my stash of lip glosses that I purchased on sale after Christmas? 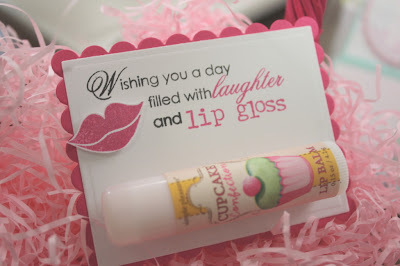 I put them to good use by making some little lip gloss goodies. I used Papertrey's Love Songs to stamp the lips in a puckery Berry Sorbet..cut them out and backed with a pop dot so they'd stand out. Then I reached for the awesome sentiment set called Heartfelt Basics....stamped the main sentiment in True Black ink and then stamped *laughter* and *lip gloss* in Berry Sorbet ink. 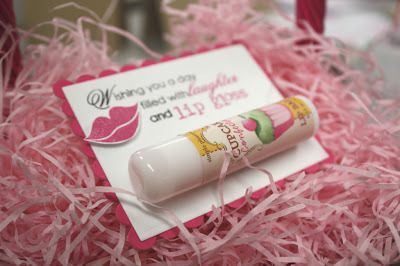 The *lip gloss* sentiment was hand stamped with a dollar bin alphabet from my local scrapbook store. I then cut out a white rectangle and Berry Sorbet scalloped rectangle using my Spellbinders Nestabilities Die Templates. You can also find them HERE at Papertrey. I adhered my tube of lip gloss to my rectangle with a strip of Scor-Tape, it's sticky enough that my lip gloss tube will stay put. 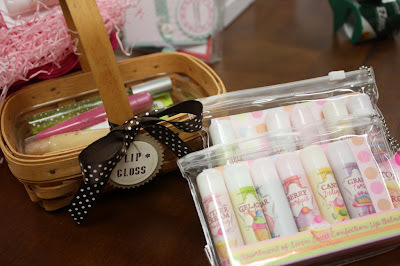 These would also make great little gifts for slumber parties, girl's night out, teacher gifts....or turn it into a guy gift for your sweetie by changing up the colors, adding in a more masculine Chap Stick tube and a *Pucker Up* sentiment. Happy St. Patrick's Day..are you wearing green???? Thank you for all your wonderful comments on my wildflower backgrounds yesterday. Lisa's set is now sold out but they'll be more in soon. What a great set!! I finally got around to organizing all of my inspiration ideas that I tore out of magazines and catalogs. I now have one huge 3 ring binder full of ideas. You'll be seeing lots more projects come about from my inspiration file. This is an ad from Pottery Barn. Citrus hues are everywhere and I'm just loving the juicy colors that are being offered. I was particularly inspired by the yellow and kraft colored polka dot pillow in the photo below. I really had fun just playing around with my new Guidelines Two stamp set, designed by Nichole. Sometimes the process is just as fun as the finished creation. Using Kraft and Stamper's Select White cardstock, I inked up several different patterns that resembled the pillow in my inspiration photo. 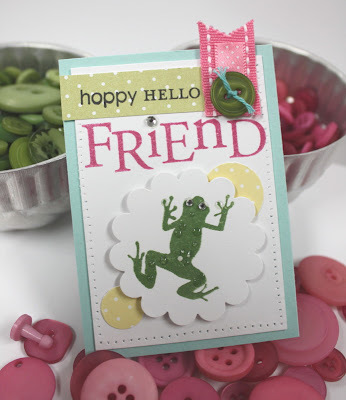 I also used Ripe Avocado, Lemon Tart and Fresh Snow inks, along with some circle punches and pop dots. When I was finished playing, I had several nice pieces to use on my cards. I added some Lemon Tart ribbon, a vintage button and some Leaf Ribbon on this first one. The sentiment is from the new Mega Mixed Messages stamp set. And here's a second version, using some of the same elements. I really encourage you to start tearing out magazine and catalog pages...looking at online websites and blog.....taking photographs. The ideas you get are so inspiring and it's so easy to just flip through a binder that has them all in one place. Note: I take my torn up catalogs and magazines to my local recycling bin....no one wants to sit down to read a magazine to find half the pages gone. :) Have a great day everyone! !